Tomorrow is eat some food on a stick day This recipe is easy and allows you to share the day with you family. Enjoy!! 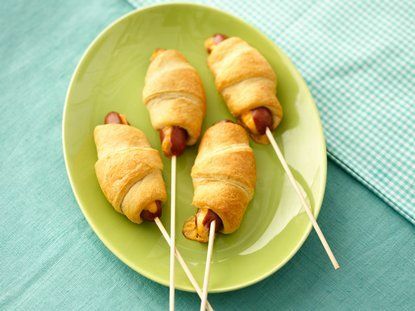 My kids love to have pigs in a blanket and when you add a stick to such a great dish I believe it makes it even better. Check out this great recipe from Pillsbury. Try it for yourself and watch as the faces of those you share it with light up with bright smiles. Heat oven to 375°F. Slit hot dogs to within 1/2 inch of ends; insert 3 strips of cheese into each slit. Separate dough into triangles. Wrap dough triangle around each hot dog. Place on ungreased cookie sheet, cheese side up. Bake at 375°F. for 12 to 15 minutes or until golden brown. Insert 1 stick in each crescent dog. Squirt enough shaving cream on the tray to cover the surface. Spread it around to make the surface relatively even, it won't be smooth. Once you have your shaving cream on the tray, squirt some acrylic paint onto it. Then using a toothpick, paintbrush, spoon, or something similar, zigzag gently though the paint to give it a marbled effect. Using cardstock or cardboard paper cut out egg shapes paint . Offer everyone something to nibble on between the Easter egg hunt and the big feast with this colorful palette of deviled Easter Eggs. I like mine with a little pepper mixed in.